The above image is from the TV miniseries, Jesus of Nazareth (1977). 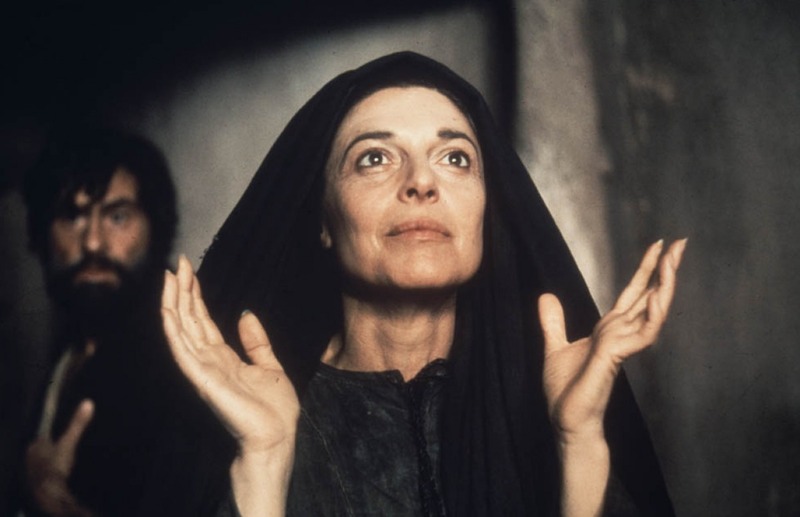 It shows Anne Bancroft as Mary Magdalen delivering these very words: Quia vidi Dominum! This holy woman (the Magdalen, not Bancroft) is called The Apostle to the Apostles. She's the one who brings the good news to the boys hiding out at home. To their credit, they don't think she's only telling tales and, fear aside, they run along to see for themselves. History changed. Persons of a certain age might trace the beginning of America's decline to the Watergate Scandal in the election leading up to the second Nixon Administration. Others will trace it to different events, especially to the codification of Slavery in our foundational documents (my nomination). But Watergate was petty bad. One of the Baddest of the Bad in the Watergate breakin was Chuck Colson. (How bad? The Wiki says, Slate magazine writer David Plotz described Colson as "Richard Nixon's hard man, the 'evil genius' of an evil administration." Colson has written that he was "valuable to the President ... because I was willing ... to be ruthless in getting things done". Richard Nixon's White House Chief of Staff H. R. Haldeman described Colson as the president's "hit man.") Convicted and sentenced for his crimes, he spent time in prison where he built up a spiritual life from the foundation of a pre-prison religious experience. Coming out of prison he founded organizations that do prison ministry. This is a marked counterpoint to one of his co-conspirators: G. Gordon Liddy. This last celebrates the event as a watershed in his life, seemingly enjoying and living up to his image of Nefarious Arch Criminal. Colson is rather like the Wise Thief on the cross next to Jesus: justly punished for his crimes, he says only, "Remember me in your kingdom..."
When I am challenged on the resurrection, my answer is always that the disciples and 500 others gave eyewitness accounts of seeing Jesus risen from the tomb. But then I'm asked, "How do you know they were telling the truth? Maybe they were perpetrating a hoax." My answer to that comes from an unlikely source: Watergate. Watergate involved a conspiracy perpetuated by the closest aides to the president of the United States—the most powerful men in America, who were intensely loyal to their president. But one of them, John Dean, turned state's evidence, that is, testified against Nixon, as he put it, "to save his own skin"—and he did so only two weeks after informing the president about what was really going on—two weeks! The cover-up, the lie, could only be held together for two weeks, and then everybody else jumped ship in order to save themselves. Now, the fact is that all those around the president were facing was embarrassment, maybe prison. Nobody's life was at stake. But what about the disciples? Twelve powerless men, peasants really, were facing not just embarrassment or political disgrace, but beatings, stonings, execution. Every single one of the disciples insisted, to their dying breaths, that they had physically seen Jesus bodily raised from the dead. Don't you think that one of those apostles would have cracked before being beheaded or stoned? That one of them would have made a deal with the authorities? None did. Men will give their lives for something they believe to be true; they will never give their lives for something they know to be false. The Watergate cover-up reveals the true nature of humanity. Even political zealots at the pinnacle of power will, in the crunch, save their own necks, even at the expense of the ones they profess to serve so loyally. But the apostles could not deny Jesus, because they had seen him face to face, and they knew he had risen from the dead. Anyone with children (of any age) know this same experience. It's hard to maintain a lie for very long at all. Heck I'll go further, anyone who has been a child knows you can't hide a lie for very long from adults who actually want to know the truth. Add to that what we know: torture and prison can make you confess to things that are, themselves, lies in order to get in good with your torturers. We have no such stories of these women and men even from powerful folks who would want such stories to be told. I heard a talk once where the speaker suggested that the Resurrection Stories were caused by guilt. Everyone felt so guilty that they had abandoned Jesus and betrayed him that they made up these stories. Sitting around the table, passing bread and wine "in memory of" him, it was almost like he was alive with them again. Gosh, that's pretty. Mary, too, and John - both of whom did not abandon Jesus - along with Mary Magdalen and a number of the other brave women should then, I think not have these guilty consciences, right? Should have spent the next 60 years calling BS on their menfolk. No such luck. Mary Magdalen is said even to have preached to Caesar. St Paul says at one point, Si autem Christus non resurrexit, inanis est ergo praedicatio nostra. If Christ be not risen again, then is our preaching vain. Miserabiliores sumus omnibus hominibus. We are of all men, the most miserable. You see how much is risked on this story by the Early Church? But more, these peasants, both men and women - many of whom had run away at the first sign of trouble - go from hiding in the dark to loud, public proclamation in a matter of days. Then they literally drop everything and scatter to the four corners of the known world: from India to Africa, to the Black Sea, to the British Isles. No, really, what the heck happened here? And fresh off the Experience of that first Holy Week and Easter, asking St Peter to explain, more than 3,000 residents of Jerusalem become Christians in one day. They know something is going on. But what? I do realize we are 2000 years removed. There seems a whole other layer of proof required now, but the initial groundwork cannot be dismissed by saying "they were all liars" or "they were all delusional." Do you die for such things? All of you? I'll let Colson wrap up here. No, you can take it from an expert in cover-ups—I've lived through Watergate—that nothing less than a resurrected Christ could have caused those men to maintain to their dying whispers that Jesus is alive and is Lord. Two thousand years later, nothing less than the power of the risen Christ could inspire Christians around the world to remain faithful—despite prison, torture, and death. Jesus is Lord: That's the thrilling message of Easter. It's a historic fact, one convincingly established by the evidence—and one you can bet your life upon. Of course, the problem is if the Resurrection is true the other stuff (moral teachings, church, etc) might also be. Deep Data from before the Beginning of Time. Sonnet XV Good Friday. 3PM. I want you. To want me. When the heart is ready the teacher will come.